ISLAY: A report of a Rosy Starling at Ardnave yesterday afternoon (per Islaybirdblog). MID- ARGYLL: 2 Greenshanks at the Add Estuary this afternoon (Jim Dickson). 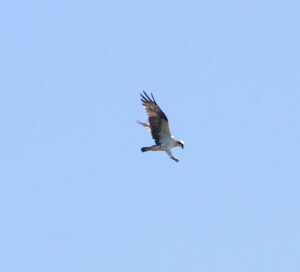 An Osprey hunting over the shallows of Ardmaddy Bay this afternoon and a White-tailed Eagle over Cuan Sound yesterday (John Sedgwick). NORTH ARGYLL: A Nuthatch, thought to be a first-year bird was at feeders in Barcaldine today (Doug Fontaine). OSPREY – Ardmaddy Bay, Mid-Argyll 13th July (John Sedgwick).